When I first saw broomstick lace, I assumed it must be very complicated. After reading a bit about it, I realized it is super easy! I’m not going to lie, it is a bit cumbersome at first, trying to prop up an extra knitting needle to work around (see pics below). 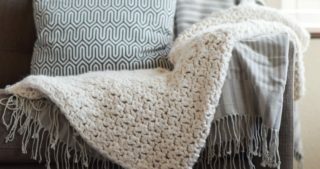 It works up pretty quickly, and at least for this pattern you only need to know how to single crochet and half double crochet. Apparently it is called broomstick lace because they used broomsticks in the past to make it. 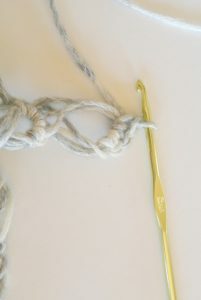 Now we just use BIG knitting needles, but you can use whatever “stick” you might like! I actually taped two of my needles together to get the size I wanted. I really needed big, open lace for this top, and this was the only way to make that happen. You can see this in my pictures below. I will describe how to do broomstick lace, but for a full-blown tutorial just head over to YouTube and do a quick search. You will see how easy it really is! 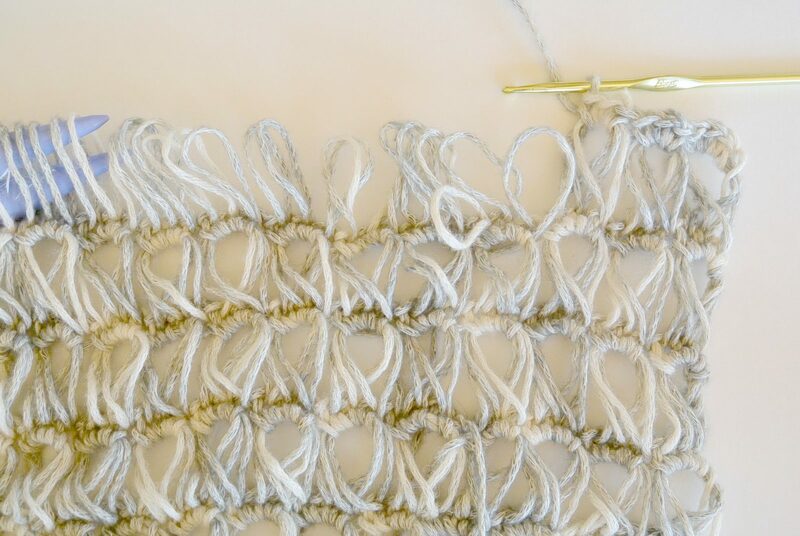 This is a great top to practice the stitch as there is no increasing or decreasing. I am really excited to wear it! *This would probably be a Women’s Small, or Extra Small (it is roomy, so could be a medium) You can adjust the size as the pattern is very forgiving. 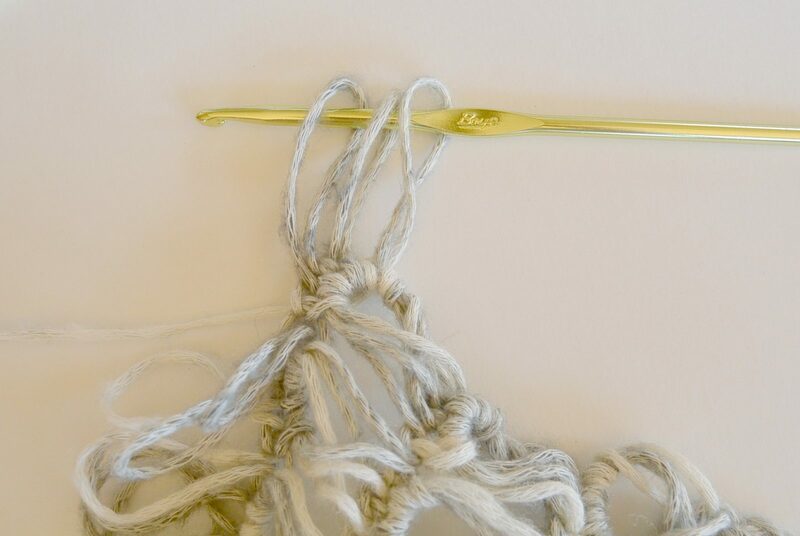 To increase the size, add stitches to your initial chain. Increase in sets of 3’s. Meaning, my pattern says 52, so you can up it to 55, 58, or 61, for example. The best way would be to make your chain the length of shoulder tip to shoulder tip. You can then follow my pattern, with your new stitch count. It is a VERY easy pattern consisting of two squares seamed together. 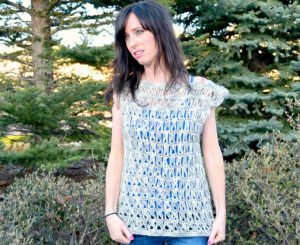 The pattern does create a neckline detail, but if you want to make this REALLY easy, just chain and do strictly broomstick lace throughout the two squares. Seam, and that’s it! *This is worked in two pieces, the front and the back. It is then seamed with slip stitches and single crochet. *The two pieces are worked from the top down, using the same pattern. Here is a Broomstick Lace Row (bL). This is the first step. Second step is to single crochet three together across row. Place the first set of three on your hook. Pull yarn through, Chain 1, then single crochet three stitches. Continue to single crochet three times in each set of three. You do not need to chain each one. You just need a chain one on the first set in order to have three sc in the grouping. See the three single crochet stitches? Row 10 *With your loop bL. bL in each stitch across (51). Use the same pattern that you used to make the front. 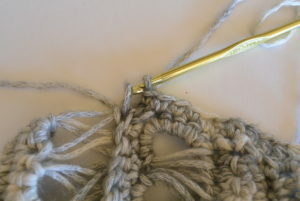 Seam using single crochet, bottom up, on both sides. Seam up until the point where you want the bottom of your sleeve opening. For me, that was eight (bL) rows up. Tie off, weave in ends. Seam the outsides of each shoulder, 2 inches in on either side with slip stitches. Tie off, weave in ends. 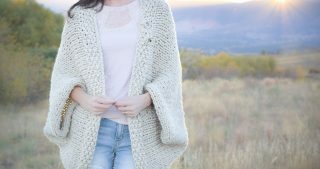 *Essentially, you are making three rows of single crochet (within that, one section of half double crochet) on the outer shoulder of your top. This is the top of the shoulder laying flat. Notice where I am starting my row of single crochet. I crochet across to the matching stitch on the other side. Work back and forth with the pattern to make the little cap sleeve. Here I am going to slip stitch at the edge of the row of single crochet. This will make it more rounded. Row 3 Single crochet across. At end, skip a stitch and slip stitch. Tie off and weave in ends. That’s all it takes for a pretty lace top! 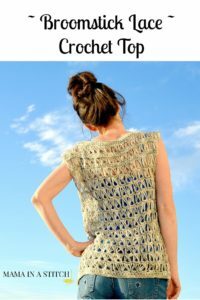 This is the first time for me explaining how to make a top! Please let me know if there is something I can improve in my pattern and descriptions! 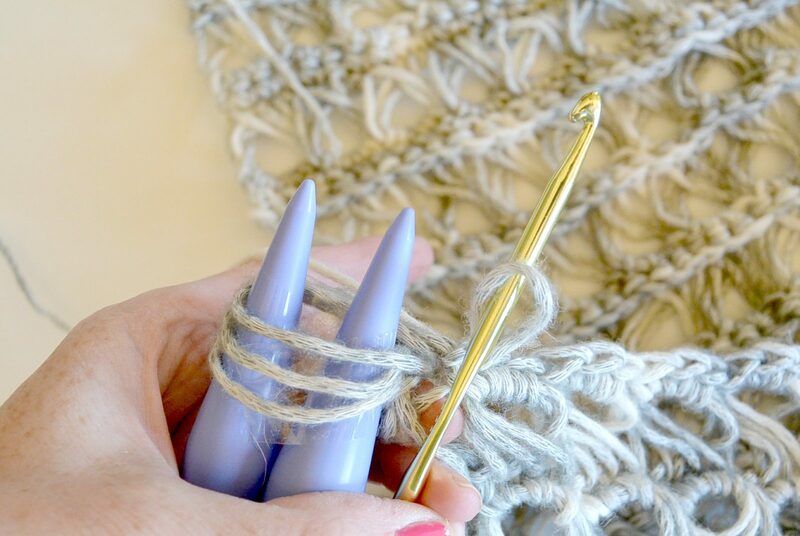 Have you tried broomstick lace before? What have you done with it? 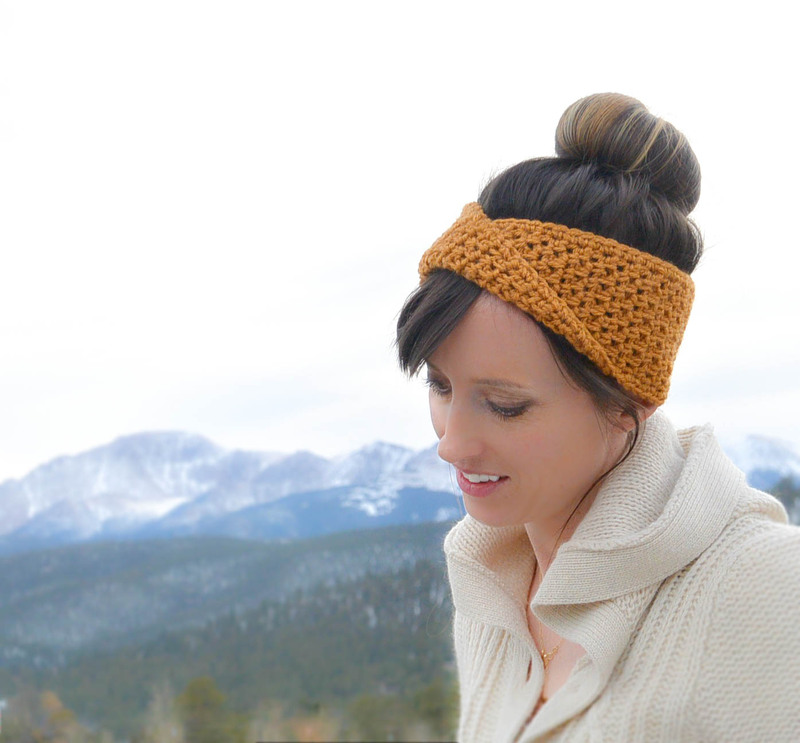 If you like this, please feel free to subscribe to the blog or my monthly newsletter for free and easy patterns! 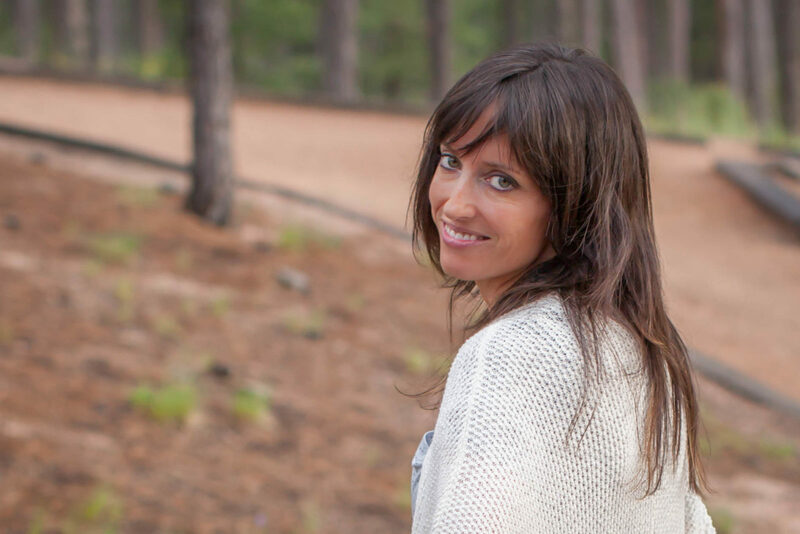 You can find me on Facebook, Instagram and Twitter! Very pretty can’t wait to get started. Jessica: I like to work broomstick lace; I like crochet; I don’t like knitting, so I don”t have the hooks. Instead, my husband prepared the Antique broomstitck. It”s more confortable, easier to crochet because I put it in my knees and only work the project with my hands. When photograph, I will send you the model. I like it to much; this lace is really beautiful. Hi Maria. I think it is so neat that you will use an actual antique broomstick (and you must have a great husband to help you prepare it) I would absolutely love to see a picture. Thank you for sharing! Very pretty top. I look forward to trying this pattern. I have never done Broomstick lace so this will b a new stitch for me to learn. I had never done it either, Mary! Hope you enjoy trying it out. Great sweater! I was going to start on a broomstick shawl, but I’m going to start on the sweater this weekend instead. You may also want to mention that you are wearing the sweater with the broomstick design upside down. Good to know! I had no idea 🙂 Thanks for sharing! made me 50 years ago!!! Isn’t that incredible? I just one to know what size it fit? How I can do a 2x size? You can make this to any size. Make your first chain the width from shoulder to shoulder. You need to make sure the stitch number is divisible by three. I did a chain 52, because that created 51 single crochet stitches which is divisible by three. 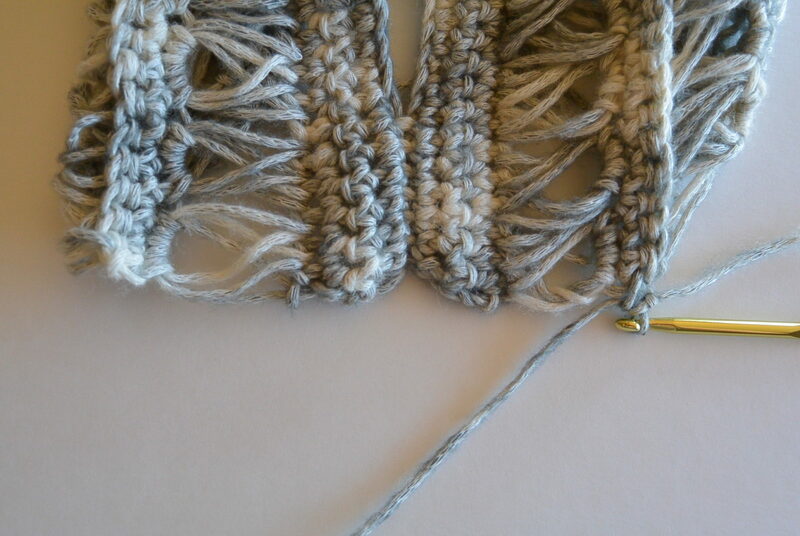 It is this way because the brromstick lace is crocheted together in sets of three. 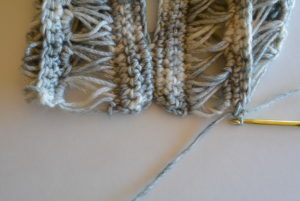 From there, you can make it easy, and just broomstick lace the two pieces, then seam together. Hope that helps! I love broomstick lace and have made many blankets using it, but with 5 loops and 5 sc. I never thought of trying in for a top. The 3 loop, 3 sc will make it lighter and work well, can’t wait to make myself one! Hi Karen, I’d love to try a blanket like you did! Yes, I thought the groups of three would be lighter for a top. Let me know how it goes if you make it! Thanks for your kind words! Hi! That looks great! Just one question, could you measure the size of your 2 needles taped together? I do not have that size of needles, but I do have some bigger ones, and I was wondering if that would work. Thanks! Hi! I wrapped the measuring tape around both needles and it measures at 4 inches around. Hope you have something similar! No problem at all! Let me know if any other questions come up! Love your design! It’s a ‘must’, you know! And I’ve got the ideal yarn at home, so I’ll start with it in no time. I made a broomstick lace scarf using 5 loops and 5 sc. It’s a Red Heart Dove color which is subtle gray variegated yarn. For the lace I used a flat ruler to loop onto and off from. I plan to use your pattern soon! It’s just what I was looking for. I love the idea of using a ruler! The yarn sounds beautiful, I bet it turned out wonderfully. Thanks for sharing. I love broomstick knitting and made baby sleeping bags. My first effort was 38 years ago making a sleeping bag for my 4th child. Made one for no. 5, 34 years ago, my granddaughter 8 years ago, a friends granddaughter 8 years ago, for my great nephew 4 years ago. The sleeping bag was made in one piece up to the arm holes and then double crochet stiches for the front and back bodice. The sleeves were in the broomstick knitting. The hood was also in broomstick. I had a zip down the front. When the little one grew “longer” I then turned it into a dressing gown. My problem now is that I cannot find my pattern something like the above? or where I could buy one similar. I have turned my home upside down looking for it but to no avail. My neighbour has now her first grandchild and I would love to make one for the baby. Have you got a pattern something like that? Wow, those must have been the most beautiful sleeping bags ever made! How special! I’m sorry, I don’t have a pattern like the one that you are looking for. I sure do hope that you can find one. I have been looking for a lacy top to crochet and believe I have found it. I am looking forward to getting started on this tonight! Thanks for the pattern. You’re welcome Chris! Sorry it took me a while to respond. For some reason your comment was sent to my spam folder. Silly internet! I hope you enjoy the pattern! I have made broomstick lace afghans in both baby and adult sizes, crocheting over 5 loops. I also made a vest once that I really liked, but I lost it and the pattern when my home burned. I have looked everywhere for the pattern again with no success. I like broomstick lace because it is so easy, and I plan to make the top shown. My goodness, how tragic that your house burned down. I hope you can find joy in making the broomstick lace again with this top. I would like to try the lace with the 5 loops as you have done in the past. I did not have large enough knitting needles so I repurposed a candy cane that used to be an outside decoration. I cut it in about 15″ sections and taped them together. The top is working up beautifully! Thanks for the pattern. Hi Nancy, I bet your afghans were beautiful. Lovely that you used up scrap yarn. I’d like to try broomstick lace for an afghan someday. Hope you enjoy making the top if you do indeed give it a try! I’ve made fingerless gloves, scarves, skirts, afghans, continuous scarfs, can be used as scarf around neck. pillow tops. Just finished another afghan for my grandson. Wow, that’s great Charlotte! Such variety. I like the look of your Top and have practised the stitch, very clumsily with 3 knitting needles taped together.also dont have correct size knitting needle, but am sick of looking at a pair of crutches my husband needed to use recently (and didnt put away!) so may find another use for them! What do you think? I say go for it! Honestly, whatever works for you. 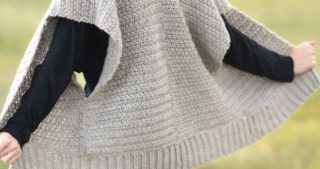 This pattern is very forgiving, and even if your loops are smaller or a different size you can just add stitches to either end so that it will fit you. Let me know if the crutches work! I went to Lowes plumbing section and bought a 1 inch PVC pipe and cap ($4 spent). An employee cut it into pieces for me so I don’t have to deal with 5 feet of pipe. It measures 4 inches around. A cap at one end keeps stitches from falling off the other end. Great idea, Dianne. Thank you so much for sharing with us. I have been making broomstick lace things for 40 yrs. The first was a baby blanket. I love doing this. I am so glad that it didn’t get lost through the years like some things have. This is a very easy top to make and it looks gorgeous. I usually use 5 strands but 3 makes it look really lacey. Thanks. This top is beautiful! I’ve looked at broomstick lace before, but it’s scared me away because I thought it was too complicated. Now, thanks to you, I’m going to try it. I have a question regarding the pattern though, what was bL stand for? I’m going to this top. Looks very nice. I want to try it in a finner string because in Puerto Rico is very hot to use yarn. Should I use a smaller hook? Hi Lara, How wonderful that you live in Puerto Rico! I’d love to vacation there some day. Yes, you can use whatever size hook that your yarn requires. You will just have to make sure to make your chain longer, or the right length. I’d love to see it – you can always post a picture to my Facebook page. Let me know if you have any other questions. So beautiful! 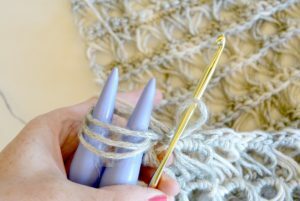 I haven’t tried this stitch, but I think I will 🙂 I love your blog, everything you do is very lovely! What a beautiful top! I have only ever used broomstick lace to make an afghan and throw pillow cover. I immediately fell in love with the idea of wearing it as soon as I saw the pictures here. 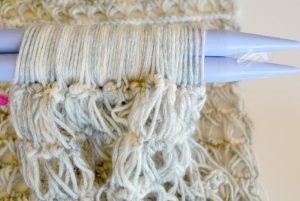 When I made my lace I only used one of the size 35 knitting needles, but I like that it would be much lighter and airy with a larger loop. My hubby also cut the blocky end of the needle off so it would slide through the loops because the work was wider than the needle could accommodate, which also made my work go faster. Thank you for sharing this unique idea for lace. I’ve been looking high and low for a pattern to work up to replace a beloved top that was damaged. After quite a long search, I’ve finally found it! I love all the comments, new to crotch, I’m very excited to make my first bit of clothing! To everyone else, can you send in photos of how each of you have described different articles? They sound beautiful, and if it is easy for someone just starting out, well I need all the inspiration to keep on! Thanks so much for the pattern! Excited to try it! Hi Brenda! You are very welcome. 🙂 I’m excited for you to make your first clothing item as well! I’d love to see it, and feel free to post a picture to my facebook page! Thanks Jessica for getting back so quickly. I understand what you’re saying, I was just a bit stuck on how to sc the loop sides together if you know what I mean. Gotcha – so, I probably did between three and four single crochet stitches in each broomstick lace loop. I’d have to go look at my shirt, but maybe that gives you some idea. It’s very forgiving, so just put as many stitches as fills the loop and continue on up the seam. Hope maybe that makes sense! Thanks very much, I know what you mean. Now I can finish it. Thank you again. Love this! Want to make it for myself ASAP. Can you tell me how long it took you to make? I have a problem starting projects that take longer than I realize and I need one that I can work up quickly before my vacation. I’ve done the broomstick lace before and love it. It looks really great as this top. This works up really fast for a top, I think. I would say if you really work on it, it could be done in 3-4 days maybe? Have a wonderful vacation! Thank you! I’ll post a pic of the top when it’s finished. Thanks again! Awesome! And you’re so welcome. Hi, still have not got around to making the top, and the crutches disappeared- however a nice new wooden Broom Handle has found ist way home, just Needs some modification! But one Thing about the pattern? It says up to ROW 8, “TURN” is Broomstick lace not worked back and forth along the “Broom”, or hav e I read your instruction wrong? Just wanted to clear it up before I start. A beautiful top with a beautiful broomstick lace. I’ve been looking for a simple pattern for a top, so I’m pretty sure I will use this pattern. I always have used and will use an actual broomstick. I think it is so much easier to use than knitting needles taped together (but you had a good idea there). I also have always used 5 loops in a set instead of 3. But I think I will see what happens using 3, since it will probably be lighter for warmer weather. Thanks so much for your nice pattern. This is such a beautiful top! I haven’t used this stitch in a long time. I’m always looking for ways to use it again. I will have to try this out! 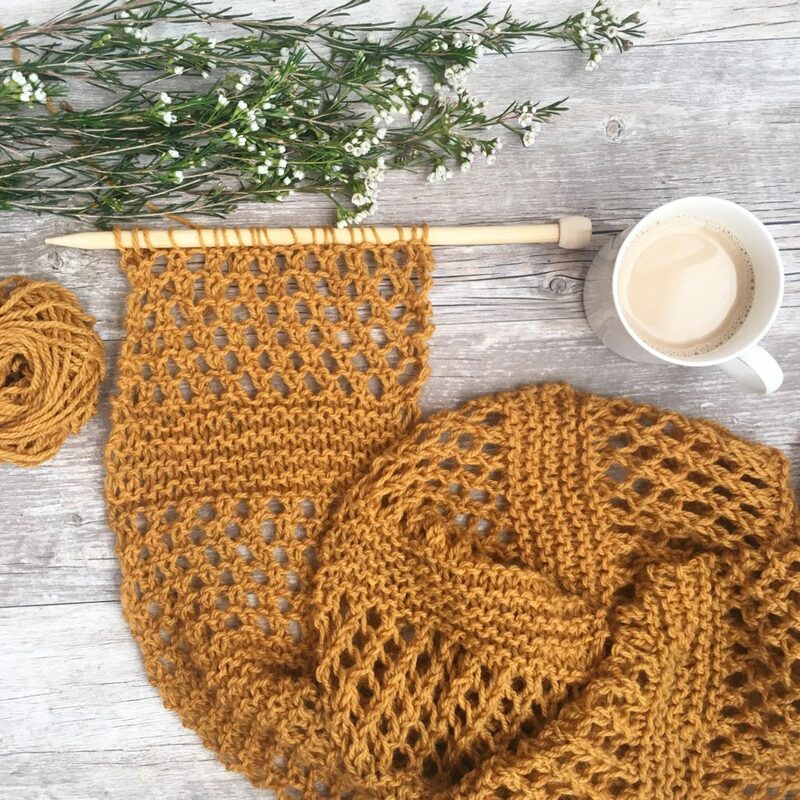 I just need to get some more yarn – such a hardship, right 😉 Thanks for sharing the pattern!! Wow!!! Beautiful!! Now to add it to my fast growing to crochet list! Thanks for sharing!!! I just love this top! It really is beautiful. I was wondering about how much yarn should you add for each size increase? 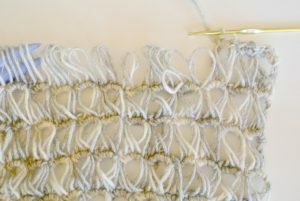 Can you use the “no chain” stitch approach to this pattern? I still do use a broomstick so I can use the floor and my feet to keep it upright. I love this top and would like to try making this. 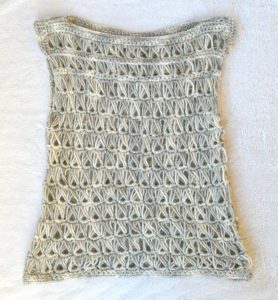 I am a beginner and this top has inspired me to learn knitting. 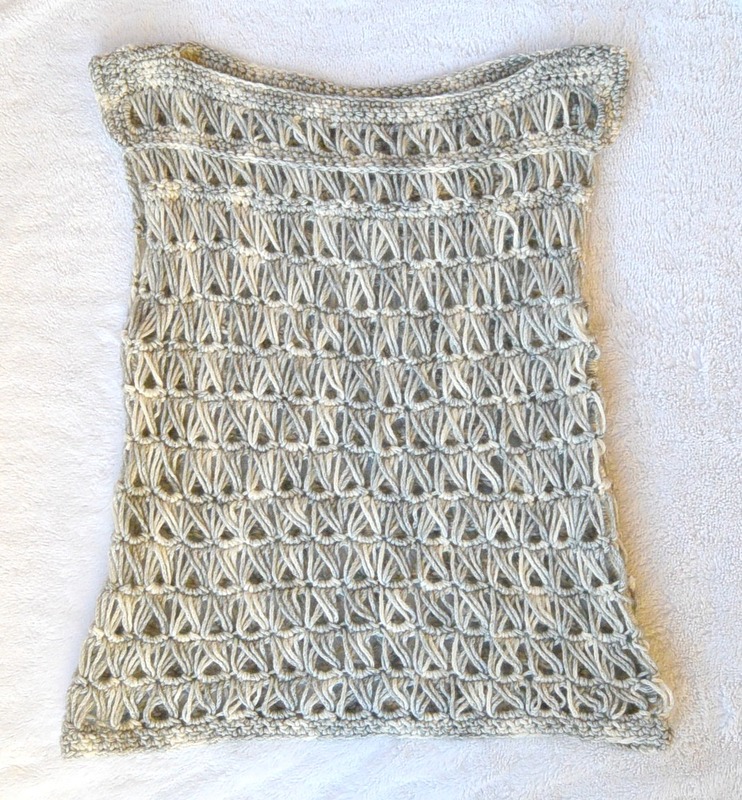 I have just learned basic knitting but would like to soon start with this top. As I am a beginner, I am unable to understand crochet language. Do you have vedio for this top so that I can learn from that vedio. I have made broomstick lace Afghans many years ago, I just adore the pattern & is so beautiful.